New photos show star birth and death in our cosmic neighbor, the Andromeda galaxy. 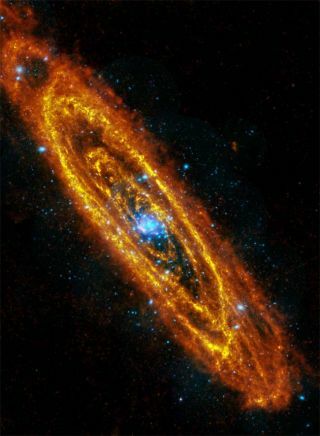 One picture, the most detailed image of Andromeda ever taken at infrared wavelengths, reveals rings of new star formation occurring in the galaxy. That photo was captured by the European Space Agency's Herschel space telescope. A second image, taken in X-ray light by ESA's XMM-Newton space telescope, shows dying stars shining X-rays into space. The photos, from different ranges of the electromagnetic spectrum, were superimposed to create a composite image. The infrared photo from Herschel shows clouds of cool dust and gas where stars can form. Inside these clouds are many dusty cocoons containing baby stars, each pulling themselves together in a slow gravitational process that can last for hundreds of millions of years. Once a star reaches a high enough density, it will begin to shine at optical wavelengths. It will emerge from its birth cloud and become visible to ordinary telescopes. XMM-Newton highlights hundreds of X-ray sources within Andromeda, many of them clustered around the center, where the stars are naturally found to be more crowded together. Some of these are shockwaves and debris rolling through space from exploded stars, while others are pairs of stars locked in a gravitational fight to the death. Many galaxies are spiral in shape, but Andromeda is interesting because it shows a large ring of dust about 75,000 light-years across encircling the center of the galaxy. Some astronomers speculate that this dust ring may have been formed in a recent collision with another galaxy. This new Herschel image reveals yet more intricate details, with at least five concentric rings of star-forming dust visible. Both the infrared and X-ray images show information that is impossible to collect from the ground because these wavelengths are absorbed by Earth's atmosphere. The twinkling starlight seen from Earth is indeed a beautiful sight, but in reality contains less than half the story. Visible light shows us the middle-aged stars, whereas infrared gives us the youngsters and X-rays show those in their death throes.